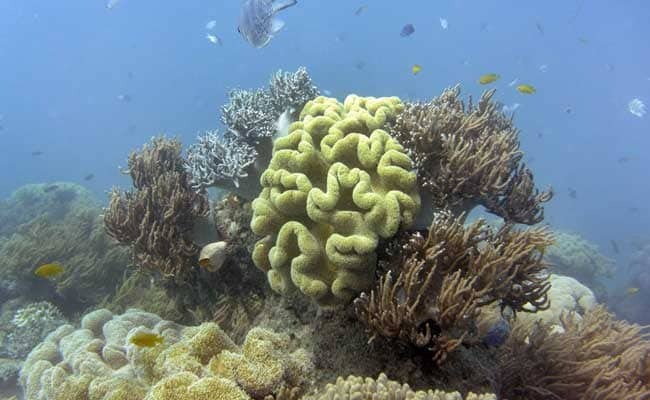 The World Heritage listed reef is the largest living structure on Earth and its economic and social value was calculated for the first time in the Deloitte Access Economics report commissioned by the Great Barrier Reef Foundation. Great Barrier Reef under pressure from farming run off, development and the crown of thorns starfish. Sydney, Australia: Australia's under pressure Great Barrier Reef is an asset worth Aus$56 billion (US$42 billion) and as an ecosystem and economic driver is 'too big to fail', a study said Monday. Using economic modelling, it said the reef bigger than Britain, Switzerland and the Netherlands combined was worth Aus$29 billion to tourism, supporting 64,000 jobs. The 'indirect or non use' value people that have not yet visited the reef but know it exists was estimated at Aus$24 billion, with recreational users such as boaters making up the rest. The study, based on six months' analysis, comes as the reef suffers an unprecedented second straight year of coral bleaching due to warming sea temperatures linked to climate change. It is also under pressure from farming run off, development and the crown of thorns starfish, with the problems compounded this year by a powerful cyclone pummelling the area. Great Barrier Reef Foundation director Steve Sargent said the study showed that no single Australian asset contributed as much to international perceptions of 'Brand Australia'. "At $56 billion, the reef is valued at more than 12 Sydney Opera Houses," he said. "This report sends a clear message that the Great Barrier Reef as an ecosystem, as an economic driver, as a global treasure is too big to fail." Commenting in the report, US presidential candidate turned conservationist Al Gore said the study was a "much needed, holistic view of the incredible economic value and opportunities provided by the Great Barrier Reef". "Any failure to protect this indispensable natural resource would have profound impacts not only to Australia but around the world," he added. The study included a survey of 1,500 Australian and international respondents from 10 countries that found people value the reef for a range of reasons due to its importance for tourism but also the belief that Australia would not be the same without it. Lead author, Deloitte Access's John O'Mahony, said it was clear the reef was 'priceless and irreplaceable'. "But we've been able to look at it as an 'asset' that has incredible value on multiple fronts from its biodiversity and job creating potential to its support for critical industries and standing among international visitors to Australia," he said. Australia last month hosted a summit of more than 70 of the world's leading marine experts to work on a blueprint on how best to respond to the threats facing the reef. Options explored included developing coral nurseries, strategies to boost culling of crown of thorns starfish, expanding monitoring systems and identifying priority sites for coral restoration. Key to the talks was the need to slash greenhouse gas emissions to prevent warming sea temperatures. Canberra in 2015 narrowly avoided UNESCO putting the reef on its endangered list, and has committed more than Australia $2.0 billion to protect it over the next decade. But it has been criticised for backing a huge US$16 billion coal project by Indian mining giant Adani near the reef, which environmentalists warn would harm the natural wonder. Environment Minister Josh Frydenberg insisted protecting the reef was a priority. "It is critical for reefs worldwide, including the Great Barrier Reef, that international efforts to reduce greenhouse gas emissions are effective," he said in response to the study. "Australia is taking strong action to address the global threat of climate change having ratified the Paris Agreement which will see Australia reduce its emissions by 26 to 28 percent on 2005." Great Barrier Reef Rodent, First To Go Extinct Due To "Climate Change"